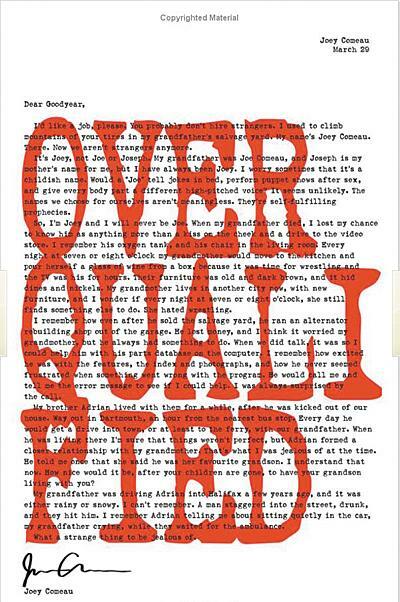 Overqualified is a humorous collection of terrible resume cover letters. Through them one gradually grows to know the weird narrator and has a number of laughs along the way. I don’t make collect calls, I make the operator pay. I mostly read Overqualified in two sittings. It was well worth the $8.59 price for the Kindle edition. How did I completely miss out on Battlestar Galactica? Finally, someone had the gumption to package this stuff! As a busy single mom, I no longer have the time to prospect for uranium, let alone dig my own open pit mine. Also, handling that stuff makes my gums bleed and I cough up small pieces of lung. Nasty. What happened next is something I barely believe myself. Because this product is uranium and not the plutonium that Doc had designed the car for, I was transported back to 1955 where everyone thought my name was Calvin Klein and my mom tried to sleep with me. Gross! I found Doc, since he’s lived in the same house his whole life, and convinced him I was from the future. If it wasn’t for the power of 1.21 jigawatts, I would have been trapped in the past forever since Amazon’s best shipping method is overnight and does not transcend the time-space barrier and I was unable to get more uranium. Well… I had an awesome idea that if I combined my newly purchased uranium ore and a container of Marshmallow Fluff, the outcome would result in a smaller version of the Stay-Puff Marshmallow Man. However… what soon followed my unfortunate science/cooking experiment was the creation of something that resembled a 10 foot tall adaptation of the Michelin Man meets Chuck Norris! Immediately upon its creation I received unprovoked roundhouse kick to my face… fortunately, his marshmallow-pillowy-like foot softened the impending blow. We battled through the kitchen, then it saw the open door. As soon as this sticky-sweet creature made it outside… it escaped. So I guess this “review” is more of a public-service announcement… I probably should’ve said that first. It’s been almost 100 days since I “disposed” of the Uranium Ore I purchased from Amazon.com. Seeing as how they sent me 10 orders instead of 1 I thought it would be alright to dispose of the two or three cans in the backyard. 91 days later and I’m barricaded in my house, beseiged by mutated grasshoppers, bees, wasps, and ants the size of ponies. My food stores are dwindling; I only have a few gallons of Tuscan Whole Milk, 1 Gallon, 128 fl oz left, though a spritz of Uranium Ore has kept it fresh all this time. I’m down to my last box of Fresh Whole Rabbit as well. Even though I had to kill them (again), some of the Uranium Ore I used on the Tuscan Whole Milk, 1 Gallon, 128 fl oz has also helped them stay fresh during these past few months. Buy your own Uranium Ore today!